Not all CHS Scanners are QX Stand-ready. To verify that your CHS 7Qi or 7Xi is QX Stand-ready. Note the metal disk near the twist-lock. 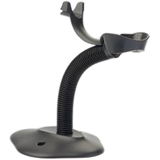 Built light-weight and maneuverable, the Socket Mobile QX Stand is designed to remain secure on any flat surface where you need to maximize barcode scanning efficiency and productivity. Good technology can be incredibly complex… but great technology makes things simpler. The CHS Series 7 Barcode Scanners are not only mobile, light weight, and elegant - they’re “NOW” Grab & Go with the 7Qi/7Xi (2D Barcode Scanners). The CHS 7Qi or 7Xi with the QX Stand come with added intelligence which lets you take full advantage of a grab and go feature for fast-moving environments. You can go from scanning by hand or scanning using the QX Stand in seconds with the 7Qi or 7Xi. Not all CHS Scanners are QX Stand-ready. To verify that your CHS 7Qi or 7Xi is QX Stand-ready, please confirm that the scanner came with a battery door as in the image below. Note the metal disk near the twist-lock. If your scanner has that battery door, your scanner is QX-Stand ready. If your scanner does not have that battery door and it is CHS 1D Barcode Scanner model (7Ci, 7Di, 7Mi or 7Pi), and you would like to use it for docking and charging purposes only. Supports Mobile Coupons - Customers can scan their mobile coupons to redeem merchandise or present electronic coupons and tickets by passing their mobile devices under the barcode scanner. Customers keep control of their devices - The QX Stand will enable customers to securely scan mobile coupons without relinquishing control of their mobile devices. Charging - The QX Stand contains contacts designed to match the CHS Series 7 scanners charging pins enabling the scanner to charge & operate under AC power when mounted in the QX Stand. An LED indicates power connection. Elegant & Functional - The QX Stands' design was carefully chosen to match the CHS Series 7 scanner style of form and function. Stationary with a twist - The QX Stands' docking Arch is mounted using a gimbal & socket to allow a 360 degree rotation and 3D tilt. Smart SDK - With the SDK your App can configure the CHS Series 7 scanner to generate a good scan LED, Beep tone, or Vibrate indication when mounted in the QX Stand and with a different good scan configuration when the scanner is gone Mobile/in your hand. For the 7Qi and 7Xi, your App can also configure Unattended Mode.